4-H is a community of 6 million young people across the world who are learning how to live healthily, be leaders, become engaged in their communities, and use science and technology to make good decisions for their future and their communities’ future. The Iowa 4-H Youth Development Program provides opportunities for youth to develop skills that they can use now and throughout their lives. Iowa 4-H builds upon a century of experience as it fosters positive youth development that is based on the needs and strengths of youth, their families, and communities. Iowa 4-H follows the principles of experiential learning and draws on the knowledge base of Iowa State University and other institutions of higher education in cooperation with the United States Department of Agriculture. 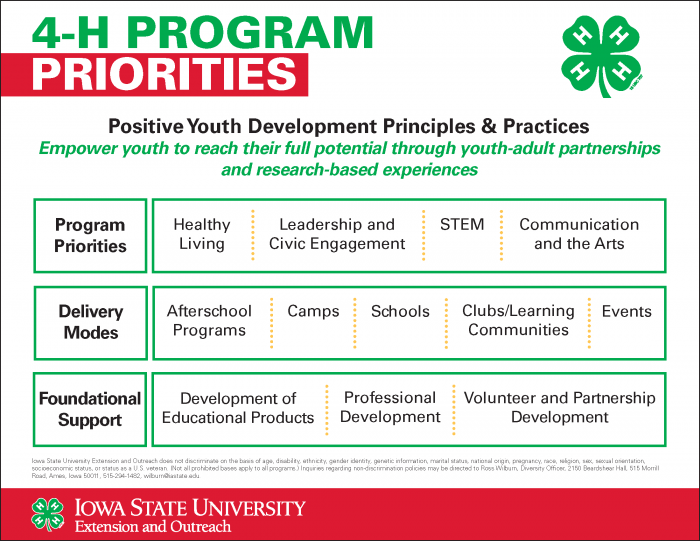 The Iowa 4-H Program's vision and mission statements clearly view youth as partners working with caring adults, and as full participants in planning and working for individual and community change. 4-H youth programs provide opportunities for youth to develop skills they can use throughout their life. Iowa 4-H builds upon a century of experience as it fosters positive youth development that is based on the needs and strengths of youth, their families, and communities. align with Iowa State University, Iowa State University Extension and Outreach, 4-H National Headquarters, and statewide initiatives. The program priorities are cross-disciplinary. It is important to ensure all Iowa 4-H delivery modes (afterschool programs, camps, events, clubs, schools) are moving youth and their parents toward sustainable learning communities, usually referred to as 4-H Clubs. Iowa considers 4-H Clubs/Learning Communities as its deepest and most sustainable level of intervention.